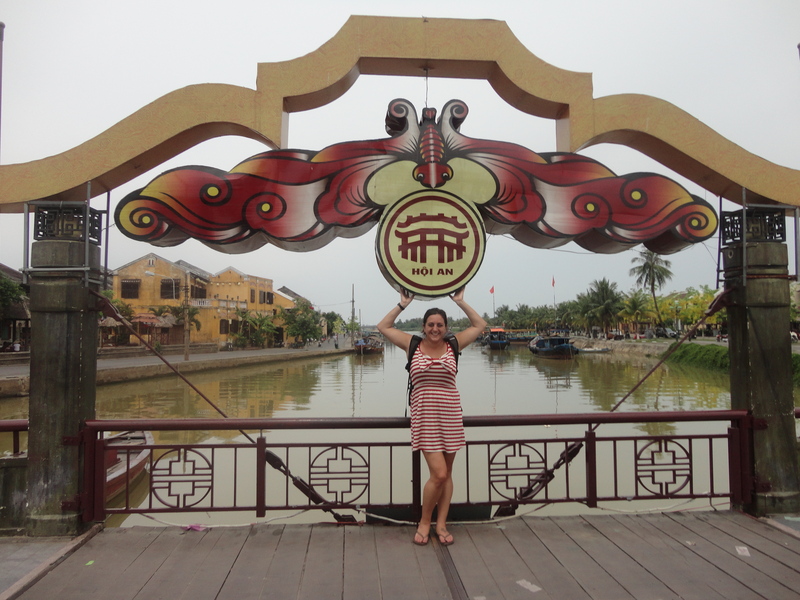 Hoi An, Vietnam – These Two Eyes! 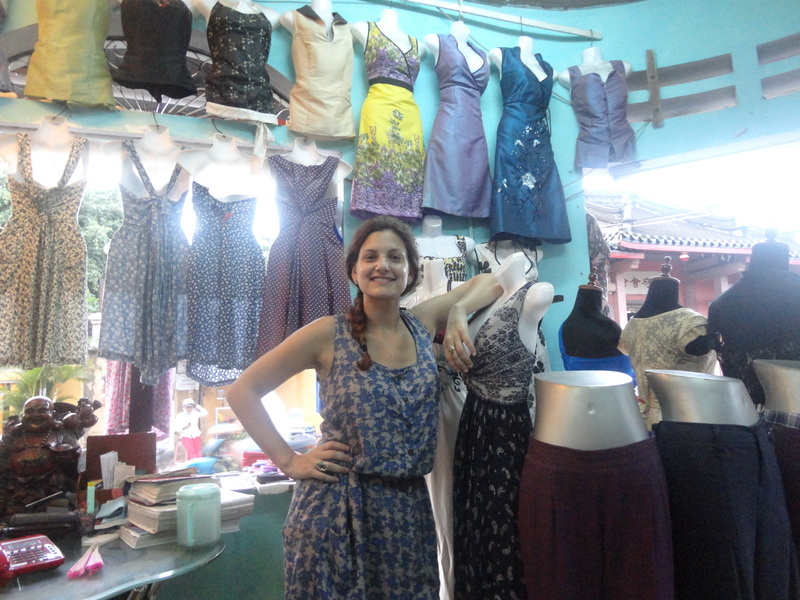 I like to say that Hoi An, a city on the south central coast of Vietnam, is a place where all things are made. Ceramics, robes of fine silk, and tailor shops up to whazoo that custom make suits, dresses and shoes to fit any shape and size. Outside of this picturesque city is the major port of Da Nang, home of Da Nang International Airport, as well as the endless white sand and tropical waters of China Beach and the cluster of Marble Mountains; each their own worth a visit. 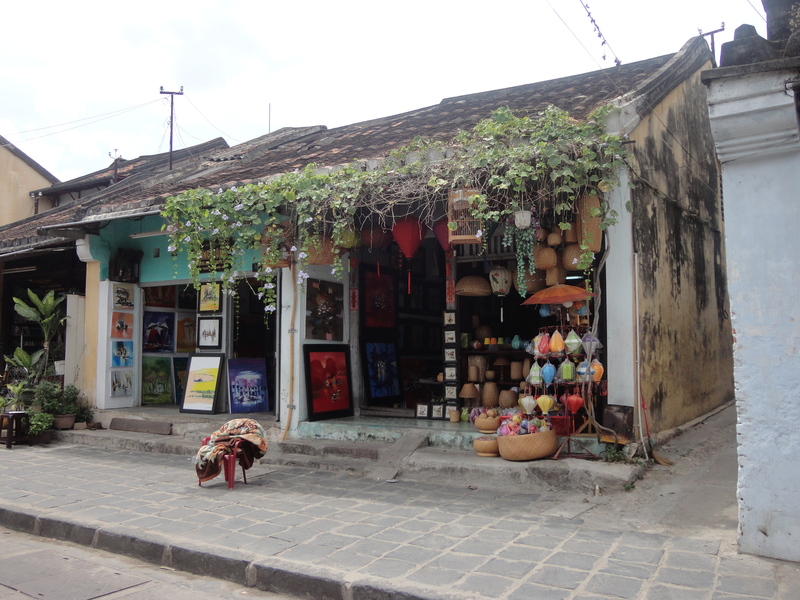 However, cutesy Hoi An is a destination to seek out. 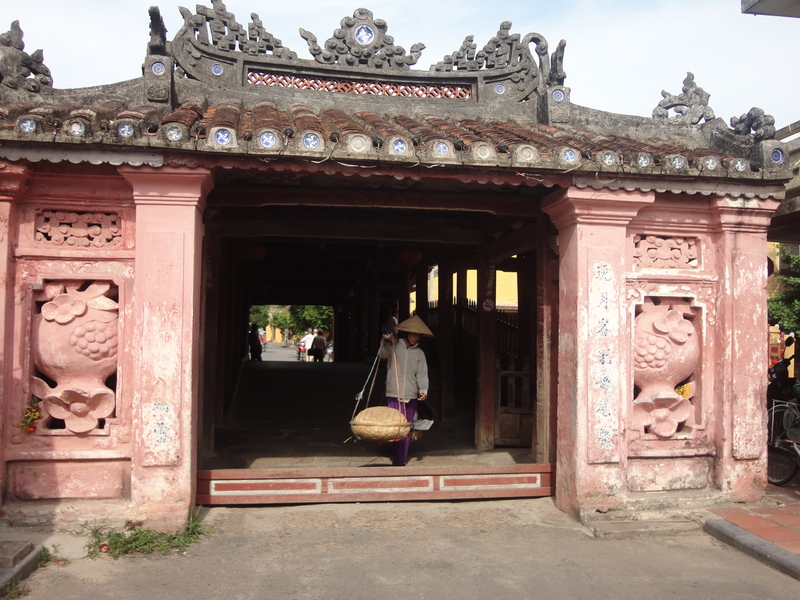 As a major trading port for Southeast Asia in the 18th century, Hoi An’s beautiful architecture reflects a strong Chinese influence in its historic homes and temples. The unique “Japanese Bridge” is apparently the only known covered bridge with a Buddhist pagoda attached to one side. 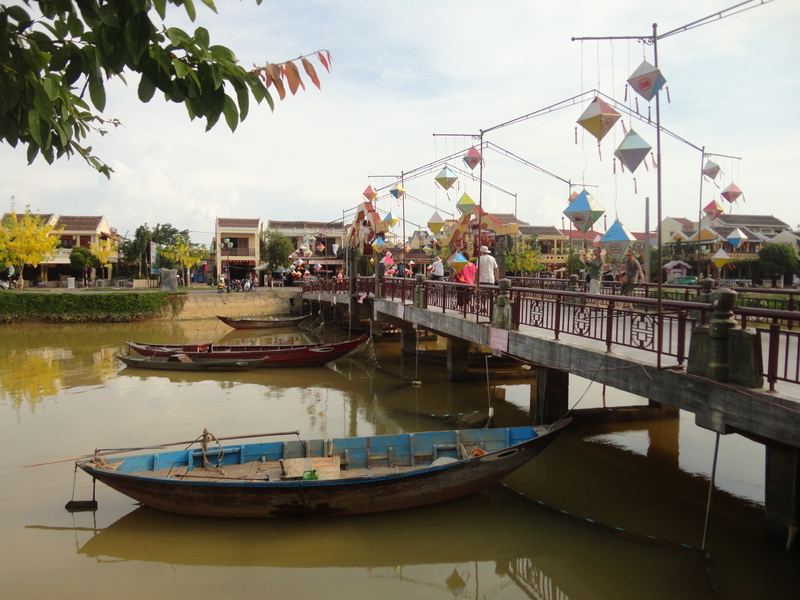 In 1999 Hoi An was designated a World Heritage Site and its old world charm makes it a “must see” place on the Vietnam tourist track. For me it was simple. Weather and fool proof Northface Jacket, $28; Silk robe hemmed on the spot, $15; 3 handmade dresses custom fit in less than 24 hours, $15 each; one pair of handmade shoes, $12. Enough said. The heat though, a bit unbearable. The small city, snuggled against the murky Thu Bon River is generally pedestrian friendly aside from the motorbikes. If there was one place in Vietnam to take a motorbike taxi, this would be your “safest” bet in comparison to the big cities, but I still chickened out. The absence of cars however makes it accessible to roam the small streets and cafes throughout on foot. Renee got the flu at this point and we were all hoping it wasn’t anything more. Heat exhaustion fell upon each of us, as we scoured the streets in search of a strong ceiling fan and ten cent beers. The days were spent in simplicity. Shower, walk, beer/fan, shop, beer/fan, lunch, beer/fan, nap, shower, shop, beer/fan, dinner, beer/fan, sleep. I had two of my best meals in all of Vietnam in this city. 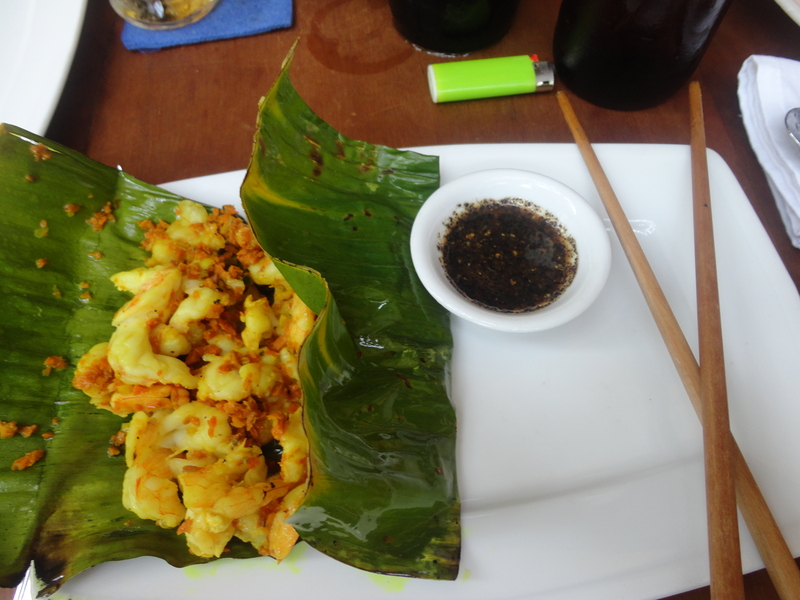 At Hai Café, in ‘Old Hoi An’, sitting outside on the veranda overlooking the various tailor stores, I had curried shrimp wrapped in banana leaf and a large cold Saigon. It was amazing and the atmosphere was cute and elegant; the perfect lunch stop off. Mermaid Restaurant on the other hand, recommended both by the guide book and by a friend, was the first restaurant in Hoi An established in 1992. The pork stuffed squid was impeccable and I’m well glad to have taken the friend’s recommendation. That is, until I saw horror on Renee’s face just as we had our plates cleared. She screamed then stood up. There was a foot long rat rustling through the ivy in the doorway above my head. Oh – my – gosh. Naturally we were all disgusted and it was right back to the hotel, into the AC and to bed. In our time spent in Vietnam up until this point we had rarely encountered many Westerners. Escaping the heat in a small café we engaged in conversation with two US veterans fulfilling their bucket list of returning for the first time since the Vietnam War. Their stories were interesting, and it was nice to engage in some casual conversations as we hadn’t met many other travelers. When they began disrespecting the staff however, demanding air conditioning because “that’s what you do for American visitors” and speaking in broken English, it was unfortunate but we had enough and preferred the company of local food and culture. The street food stalls, the cafes, the rows upon rows of tailor shops, motorbikes whizzing by your ear and colorful lanterns lighting the streets at night. Definitely worth a visit. Unfortunate the Vets took that attitude, And I understand the heat exhaustion. We are having some nasty weather here; the heat, humidity and poor air quality really make it unpleasant.